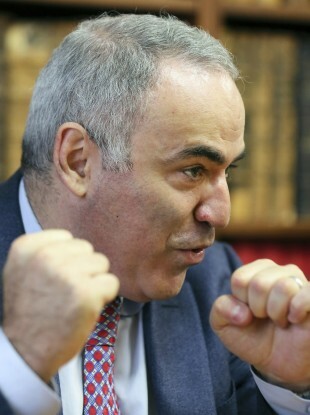 Garry Kasparov was arrested for peaceful protests on several occasions, the court found. THE EUROPEAN COURT of Human Rights (ECHR) has condemned Russia for its treatment of former world chess champion turned Kremlin foe Garry Kasparov, the second such ruling in two months. The latest judgement said his arrest and that of fellow activist Aleksandr Averin en route to a 2007 opposition rally in Moscow was unjustified and designed to discourage other such protests. Riot police arrested Kasparov, Averin and five other campaigners on their way to the peaceful protest on 24 November, 2007. They were accused of marching without authorisation and refusing to disperse and eventually sentenced to five days’ detention without getting a chance to present a defence, said the court. As with several similar cases before the court, Kasparov and Averin were arrested at an “undeniably peaceful” procession and sentenced “without any assessment of the disturbance they had caused”, said the ruling. “The chilling effect of the sanctions had been amplified by the fact that they had targeted Mr Kasparov, a well-known public figure, whose deprivation of liberty had been bound to attract wide media coverage,” the court added. Kasparov and Averin tried unsuccessfully to get their sentences overturned through the Russian courts before turning to the ECHR, based in the eastern French city of Strasbourg. In an earlier 11 October ruling, the court ruled that Kasparov had also been illegally detained ahead of another opposition rally, on 18 May, 2007. Kasparov was one of the founder members of the opposition Other Russia movement in 2006. He now lives in the United States after trying to mount a rival bid to Vladimir Putin in the 2008 Russian presidential election. The ECHR was set up in 1959 to deal with alleged violations of the 1950 European Convention on Human Rights. Email “World chess champ and Kremlin foe wins European court case against Russia”. Feedback on “World chess champ and Kremlin foe wins European court case against Russia”.